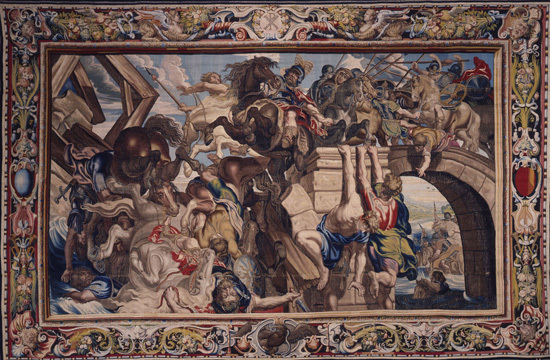 Battle of Milvian Bridge – every day's a holiday! October 28, 2010 marks the 1698th anniversary of the Battle of Milvian Bridge, a battle of two Emperors that changed the course of history. Maxentius and Constantine were brothers-in-law, both had valid claims to the throne thanks to Diocletian’s division of the Empire in 306, and both their fathers had been previous Emperors. In fact, Maxentius’s father had committed suicide after a failed rebellion against Constantine. In 312 A.D. Maxentius held Rome; Constantine held the north. Hearing of Maxentius’s claim, Constantine gathered his army and headed south, encountering Maxentius’s troops at the Milvian Bridge just outside Rome. The actual Milvian bridge was not functional, perhaps purposefully destroyed by Maxentius in preparation for the expected attack. But Maxentius made a grave tactical error. He used a makeshift pontoon bridge to transport his troops to the other side of the Tiber, and placed them too close to the riverbank. Constantine, a 40 year-old veteran of campaigns against the Franks and Gauls, forced Maxentius’s army against the river, allowing them only one means of escape: the bridge. During the retreat, the bridge collapsed, and the portion of Maxentius’s troops stranded on the north side were slaughtered or taken prisoner. Maxentius supposedly drown in the river. His body was found, decapitated, and paraded through Rome the following day. Constantine’s victory over Maxentius was later seen as a victory of the Christian god over the Roman pagan deities. Constantine became the first Christian Emperor, reversed the ruthless persecution of Christians that had dominated the reign of Diocletian, and implemented a policy of religious tolerance throughout the Empire. Though not an official holiday, many Christian sects observe the anniversary of Milvian Bridge on October 28 in memory of the historic turning point of early Christianity.